Today’s process plants not only undergo frequent audits of magnetic protection equipment, but also frequent re-jigs and iterations as new products or process methods are introduced. Accordingly there has emerged the need for magnetic protection that is not a major capital investment and which makes change or redundancy more manageable. With the cost of high-grade neodymium rare earth magnet materials coming down, Serpent and Dove Pty Ltd has introduced its ‘Econo-Grate’ range of Grate Magnets, providing all the strength required (10,000 Gauss or 1 Tesla +) to get fine and difficult iron out of foods, plastics and powders, whilst not breaking the bank. 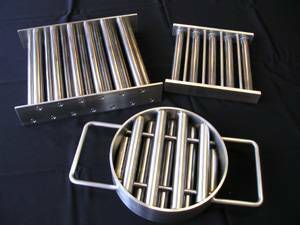 Available in food grade construction in round, rectangular, square or special profile configurations as well as in housings if required, Econo-Grate from Serpent and Dove represents the next step in the assured removal of iron contamination from food, grain and other products.